Nothing rivals the snap of a bar of chocolate and the rich, milky taste on your tongue. Unfortunately, some medical conditions may make it difficult to enjoy the sweet treat. Eating too much of anything -- including chocolate -- will give you a stomachache, so exercise moderation in your indulgence. Chocolate is a common trigger for gastroesophageal reflux disease, a more serious condition related to heartburn. GERD occurs when the sphincter between the stomach and esophagus does not seal tightly, allowing stomach acid to wash back into the esophagus. 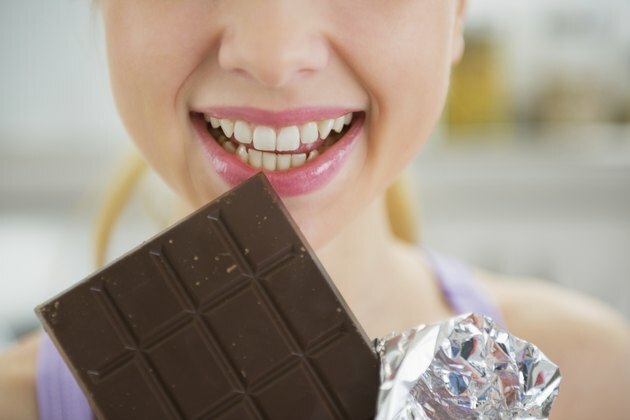 Avoiding acidic foods such as chocolate is part of the treatment. Another reason you might experience abdominal pain after eating chocolate is because your body can't tolerate the lactose sugar found in dairy products. For individuals with lactose intolerance, milk chocolate would cause problems, but dairy-free dark chocolate could be fine. Chocolate may cause you stomach pain if you have a hole in the lining of your stomach or small intestine called a peptic ulcer. With treatment, ulcers heal in several months, so you should be able to enjoy chocolate again, according to MedlinePlus.